The Word for World Is Still Forest, Ed. by Anna-Sophie Springer, K. Verlag, 2017. 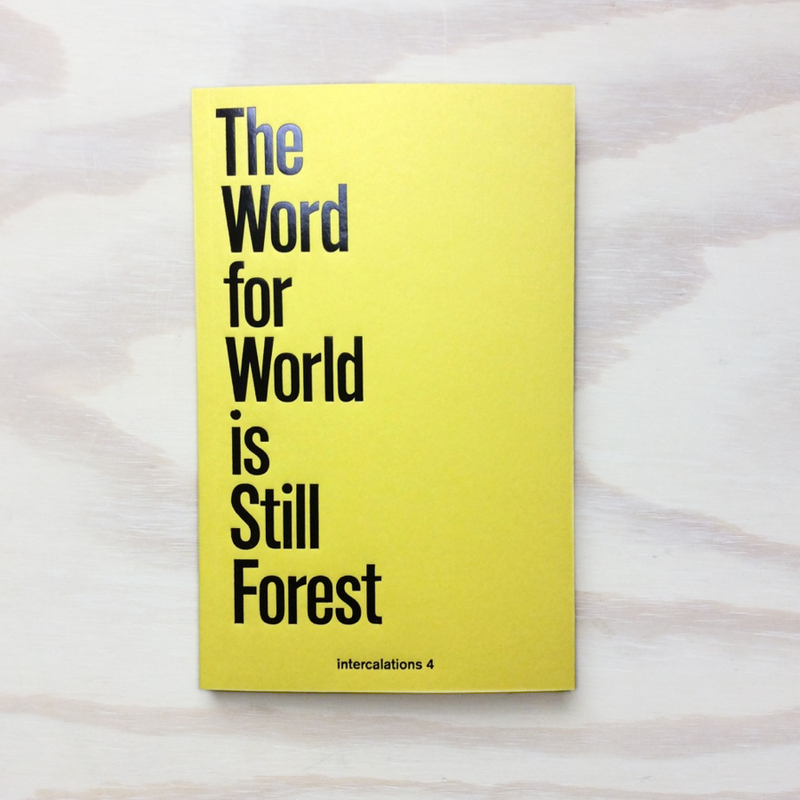 "Taking its title from Ursula K. Le Guin’s 1972 novella, The Word for World Is Still Forest curates an homage to the forest as a turbulent, interconnected, multinature." If you get lost in the forest, authorities advise that you stop moving and stay in one place to avoid confusion and increase the chances of being rescued. We see things differently: we suggest you stray far from paths cut by familiar habits and explore some of the innumerable perspectives on and of the forests that sustain this world. Reverse Hallucinations in the Archipelago unfolds an itinerant encounter with nineteenth-century European naturalists in the Malay world, where the theory of evolution by natural selection emerged alongside less celebrated concerns about mass extinction and climate change; by re-considering the reverse hallucinatory condition of colonial science in the tropics—how scientists learned to not see what was manifestly present—the reader-as-exhibition-viewer may exhume from the remains of this will to knowledge an ethical conviction of particular relevance for confronting forms of neocolonization in the Anthropocene. Reverse Hallucinations in the Archipelago reflects on the changing role of colonial natural history collections in the current ecological crisis called the Anthropocene. The volume features an essay by Anna-Sophie Springer and Etienne Turpin, which considers in parallel the histories of scientific publications and personal letters sent by European naturalists from the tropics in order to discern a schizophrenic dilemma at the core of the colonial-scientific project. The book also includes a science fiction graphic novella by Mark von Schlegell, Iwank Celenk, and The Slave Pianos (with Punkasila) about a futurist entomological meltdown. Photographer Fred Langford Edwards presents a series of works documenting tropical specimens held in the natural history collections of the British Natural History Museum, while artist Lucy Davis uses DNA tracking and oral history to retrace the path of teak furniture from Singapore to Indonesian plantations. Also featured in the collection are interviews with the director of the Wallace Correspondence Project and entomologist, George Beccaloni, and the geologists James Russell and Satrio Wicaksono, who discuss, respectively, the history of biological specimen collecting and a drilling project in the Malay archipelago which recently obtained 300 meters of soil samples containing 800,000 years of Nusantara climate history. To compliment these collections, musician Rachel Thompson adds a two-part composition relaying the Javanese osteo-mythology of the Dutch paleoanthropologist Eugène Dubious. Finally, the volume includes an original translation (from German) of a text by Matthias Glaubrecht, Scientific Director of the Hamburg Center for Natural History, which outlines the maddening rate of species extinction in the rapidly transforming Malay world, an interview with Zenzi Suhadi, Head of the Department of Research, Advocacy, and Environmental Law at the Indonesian non-governmental organization WALHI/Friends of the Earth, as well as a series of aerial drone photographs documenting some of the most recent transformations of forest landscapes in Nusantara.